With wages stagnating and real estate booming around the country, owning a house in a major American city seems about as likely as hitching a ride to Mars for many of us at the moment. In a lot of places, just paying rent is enough of a struggle. However, you might be surprised where you can buy based on what you make, according to this enlightening new map that reveals the annual income needed to afford a place of your own in the 15 largest US cities in 2019. If you're toying with the idea of putting down roots somewhere or are just curious where might be the most financially viable place to do so, SmartAsset has put together a handy guide on what you need to make in order to live in some of the most popular places in America. 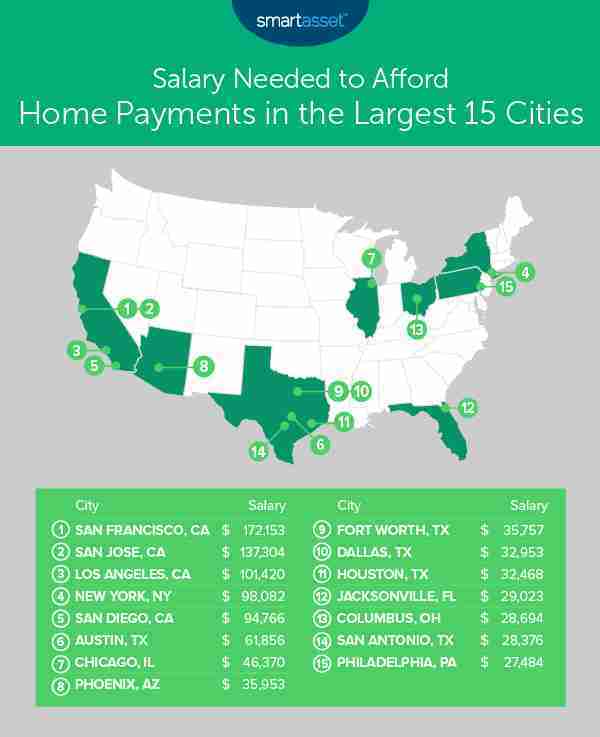 Specifically, they've crunched the numbers to determine what your salary needs to be in order to comfortably afford mortgage payments on a median priced house in the nation's 15 largest cities. To figure this out, the SmartAsset team gathered data from the US Census Bureau and calculated how much a 20% down payment would cost on a median value home in each of the 15 largest cities. Then, they plugged that into their mortgage calculator (assuming each prospective buyer would get a 30-year mortgage with a 4% interest rate for 80% of the value), added up the total monthly mortgage payments, real estate taxes, and homeowners insurance to determine the minimum monthly income needed to make it work. Finally, they ranked the cities from highest to lowest minimum income needed to buy a home, and plotted it all on a map. Unsurprisingly, you'll need to earn the most to afford a house in San Francisco, where the minimum income needed in 2019 is $172,153. On the flip side, the most (relatively) affordable city to buy a house right now is Philadelphia, where your income only needs to be $27,484. Here's what you'll need to earn annually in each of the 15 largest cities to afford a median priced house, ranked from cheapest to priciest. If you hadn't already heard, you need to bring in a good chunk of change every year to be able to afford to buy much of anything in California and that's doubly true if you're carrying any debt (it's worth noting these income calculations assume that prospective homeowners are debt-free). 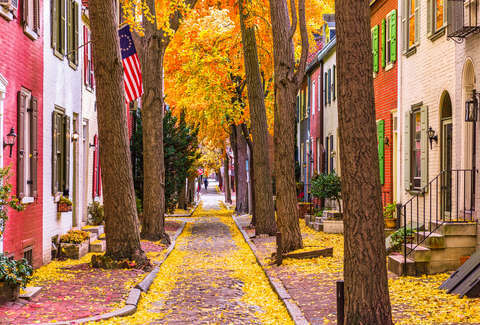 Still, there are some bargains to be had in hotspots like Chicago and Philadelphia, and that's true even if you are burdened with some debt. That said, if you're willing to broaden your geographic scope of home cities beyond the US, there are plenty of charming locales where you can live quite well for much, much cheaper.